Okay. This is the everything else post. Mainly what we’re finishing up with are heads, hands, and the stand. 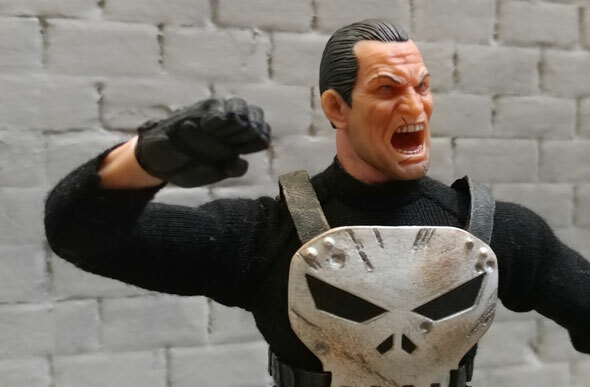 To capture the many moods of Frank Castle, Mezco included 3 different heads. One is normal, the second is open mouth yelling and the last is a beat up, end of battle head. One thing I really like about these is that the head is obviously the same character. It would have been easy to kind of make a different look for each of these, but they kept it as same base. The heads are all painted very well, especially for this scale. There is depth of color here that really adds to the realism of the face. 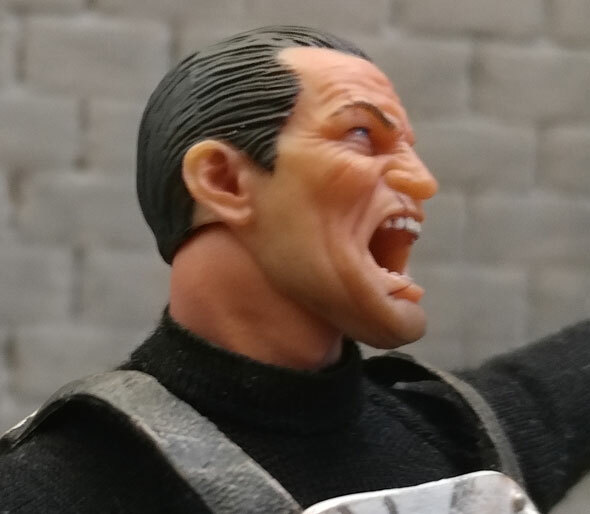 To me, this head looks like what all of the airbrushed Hasbro promo pictures look like for their figures. 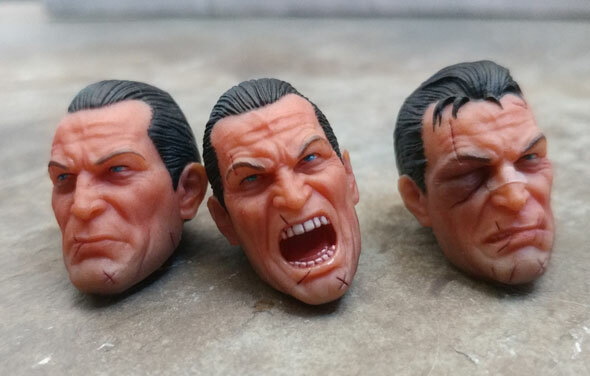 All of these heads also have matching scars that are very slightly highlighted. The standard head is a basic museum type facial expression. 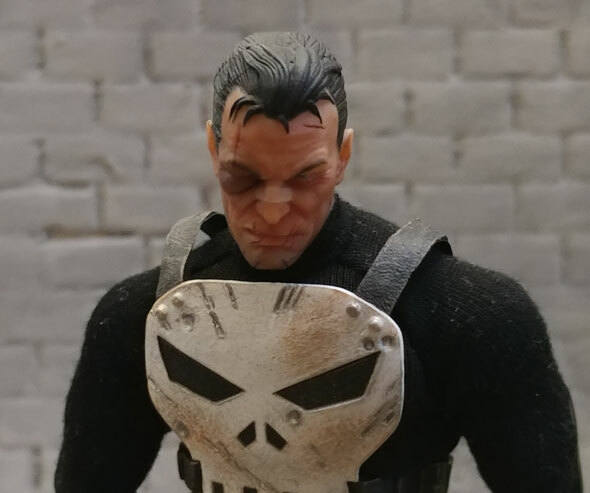 There’s a bit of five o’clock shadow going on that the Punisher always seems to be sporting. This is my favorite head overall. All of the heads snap easily on and off of a ball at the end of the double jointed neck. 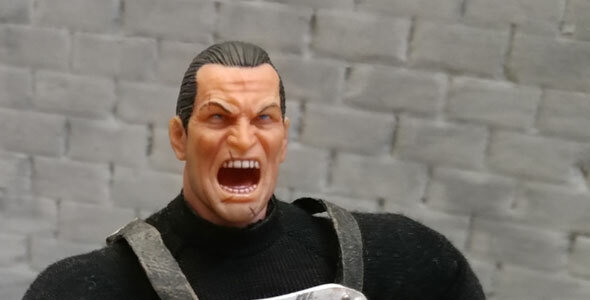 The screaming head is a work of art considering the details painted in around the open mouth. This looks like an open mouth should look, with teeth and tongue and so forth. The eyes and forehead get extra stress wrinkles from his efforts. One thing to note is that the because the heads are painted so beautifully, the neck stands out a bit. Not much, mind you. It just looks a little more plastic like in some lighting. The end of battle head has a black eye to differentiate it. Whatever happened, it looks like he also broke his nose. My favorite detail on this head is the mussed hair though. This is my second favorite head. The paint around the black eye looks extremely good, and painful. Of course, you can’t by a “collector’s” figure these days and not get a bunch of hands. 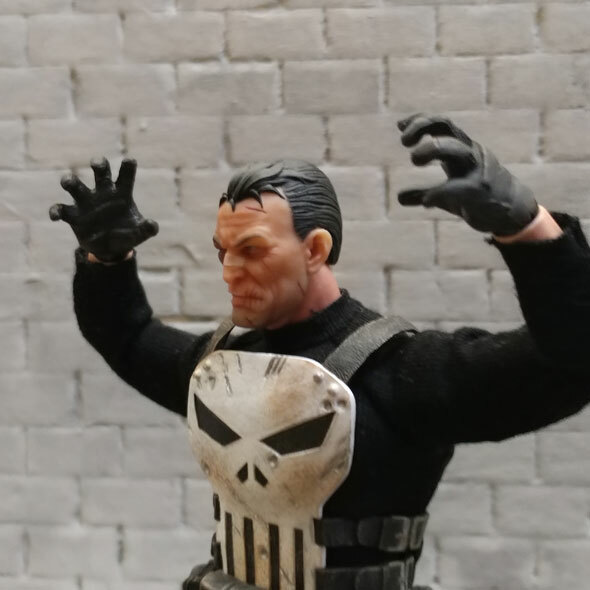 I have to say Figuarts have spoiled me with hands. Frank is no exception. But like other figures, There’s some good hands, subtly different hands, and hands I just don’t get. 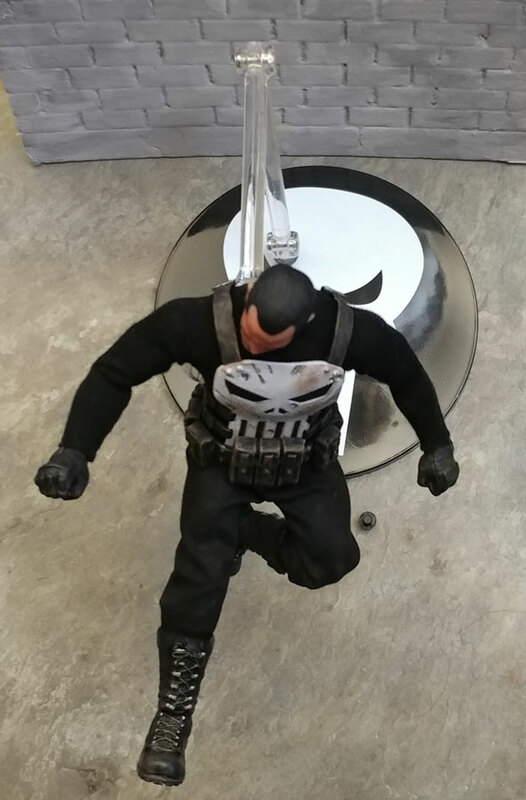 The figure comes out of the box with two fists. 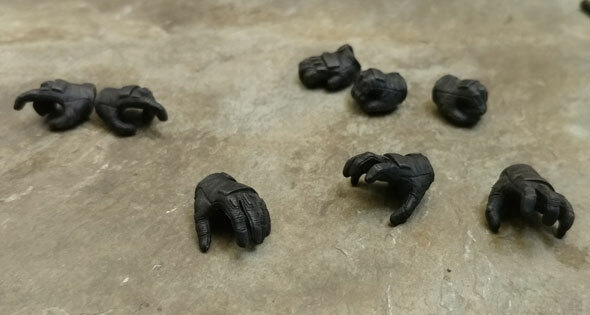 All are sculpted as black tactical gloves, which makes sense for the character. 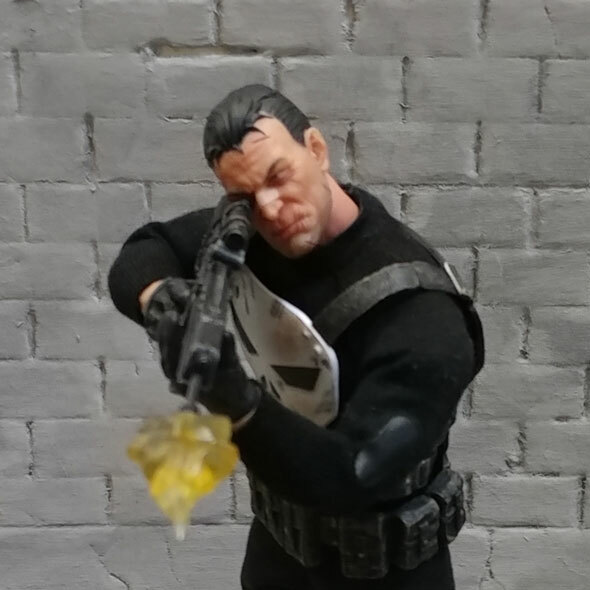 After the the fists, the next most important hands for the Punisher, are of course trigger fingers. These also work with the knife. They don’t quite enter the trigger guards, but they are close enough that you won’t care. There is one left hand that I’m going to call semi open. It hold the fronts of the rifles well enough. It could almost be a relaxed hand with no splay to the fingers. There isn’t a right handed version of this hand. Next up are the “I’m a monster coming to get you” hands. These are probably intended as grappling hands, the fingers are splayed wide open on these. They hold the front of the grenade launcher pretty well, but honestly, I don’t know what else I would use these for. Last up is a throat punch right hand. I get it. It looks cool. I don’t know that this is different enough from a fist to warrant its’ inclusion here. 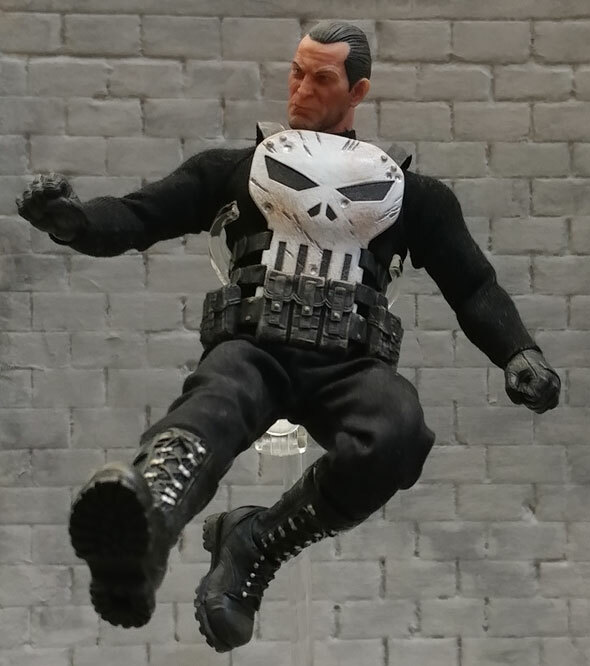 I’ve always seen Frank as a straight up brawler and less of a martial artist. Again, I’m not sure I ever see this hand getting used. It’s very deep to from front to back. Which means a couple things. First, it takes up a lot of display space. More than I’d be willing to give up. Second, the weight distribution of him hanging on the end of the arm. I have my doubts this would be as stable on a shelf as you would really want it. If I was going to use the stand, I would probably use it with the foot peg. Last up is a small fire effect for the weapons. It is a muzzle blast with a small peg that fits the pistol, MP5 and SCAR. It is flatter than I expected, but it really doesn’t take away from the effect. It’s translucent and really captures that gun just fired effect pretty well. So well, in fact, that they sculpted a bullet and painted it at the end. I didn’t notice that at first, but was really, pun intended, blown away. 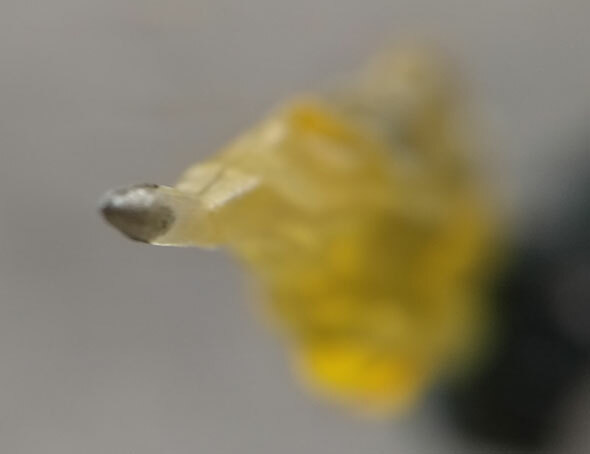 That bullet is really a good example of what this figure is all about, detail. They have got so many of the little things just right, that the figure exudes quality. Honestly, I was skeptical about the price when I pre-ordered him. But since I’ve first taken him out of the box, I’ve never thought about it. There is always room for improvement, but this figure is a masterpiece. I’m so happy that I took the plunge for one of my favorite characters. I really want a Batman now, but haven’t seen the perfect one (yet). 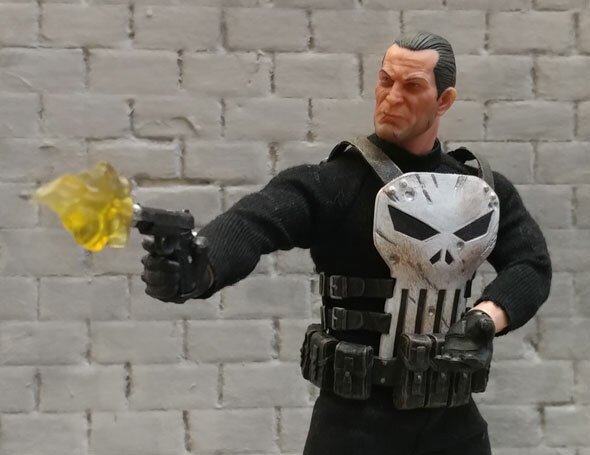 If you have a favorite character, and Mezco adds them to the One:12 Collective line, you really should add them to your collection. I doubt that you would be disappointed.